Warcraft: Legion – Endgame Perfected? With a few notable exceptions, levelling in MMOs is a temporary experience. We get a few weeks of meaty questing and cinematics, followed by months of waiting for content updates. It’s the Achilles Heel of the theme-park experience – rich and deep while it lasts, but bland and repetitive once the cap is reached. I’ve made no secret about how much I was put off Mists of Pandaria, seeing a small forest of exclamation marks to mark the daily quest hub, as if to signify where I’d be spending the rest of the expansion. Warlords of Draenor tried to mix it up with the Garrison experiment, but it left me feeling less like a hero and more like a middle manager. Which is why I’m surprised with how I feel about Legion. Sure, there’s an element of nostalgia here, as familiar NPCs play out a story that feels more like a main event than a timeline-based distraction. But it’s also been – and continues to be – hugely enjoyable to play, and that includes the time I’ve spent dancing around at cap. How has Legion pulled off this magic trick? Looking deeper, I think there’s a clever blend of design choices at work, all acting together to make that endgame experience as frictionless and immersive as possible. 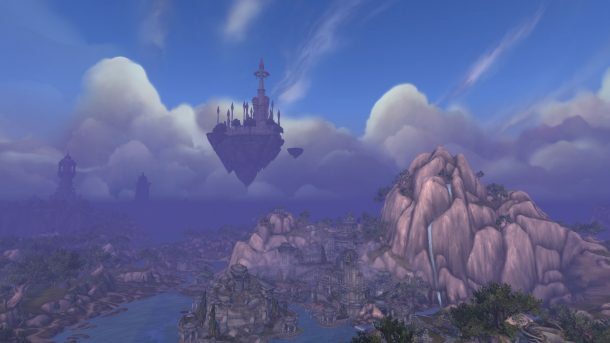 With the biggest impact by far, Legion’s World Quests turn the entire Broken Isles continent into a playground for level capped players. By using the existing phasing mechanics and combining it with new scaling techniques to adjust mobs depending on the character you’re playing, it’s possible to add a quest anywhere and know that it’ll work for endgame players. Not only that, but there’s a blend of PvE, PvP, crafting, fishing and battle pet quests to choose from, with a range of rewards including new gear, resources, gold, and power for the artefact weapon. Picking them up is simple – just wander into the area and they start automatically, with rewards being placed straight in the inventory. Those rewards also seem to vary depending on the class I’m playing, ensuring that they’re always relevant. The lack of a daily quest hub is refreshing in itself, but the other nice change is that these quests aren’t daily. Some stick around for 2 or 3 days, while others are gone in 18 hours or less. It means that there’s regularly something to check back for, with the world map making it easy to find something worth doing. And although I can gorge on World Quest, a simple nudge helps discourage me from doing so. Emissary Quests, which nudge players to particular types of World Quest, only require four-of-a-kind to pay out rewards of reputation and loot. They last a few days and build up over time, so I don’t feel I need to log in every day either. It finally feels like Warcraft is allowing me to flex my game around when I have time, and still feel nicely rewarded. Alongside the continual assortment of world quests are three distinct story campaigns, which can be investigated or ignored on a whim. I’m usually a lorehound and crafting fanatic, but the Order Hall campaign still has a few turns left even though I’ve been at level cap for a while. And even though I’ve unlocked most of the secrets of Tailoring and Enchanting, I’m still hopping around the Broken Isles when I have time to carry out a particular mission or pick up a pattern. Suramar, however, is a clever piece. A gradually unfolding story that opens up, slowly revealing an incredible city that constantly makes me feel like an intruder, a subversionist. A population with a future that’s bound tightly to the expansion, and which I desperately want to release from the Legion’s yoke. It would have been easy to build it in a similar style to Shattrath, open to all as a new capital city and brimming with traders. But this dichotomy – can’t stay as an outsider, can’t leave because the people need help – makes it all the more alluring and mysterious. The result is that I feel like I’ve got an engaging blend of content when I log into Legion, which feels like it will last for some time to come. I’m expecting the Order Hall and Profession Quests to conclude shortly, but I can easily see new chapters being patched in as the expansion unfolds. The vital part is that the framework is there, ready to be expanded on. Likewise, the World Quest system seems to be built in such a way that new challenges can be added as old ones become stale. I wouldn’t be surprised if someone at Blizzard is tracking the metrics behind these missions, looking at which ones are popular and working out why so that more of the same can be added in the future. I’ve seen echoes of the system in other MMOs (notably WildStar’s Contarcts), but this is the first time I’ve seen it in such an accessible form. And I’ve not even mentioned some of the hidden gem quests that incredibly creative players have painstakingly pursued. The big question, however, is in how long it will last. Just because a framework exists doesn’t mean it’ll constantly get refreshed. Likewise, players are a fickle bunch, and it’s possible that today’s hot content will be tomorrow’s stale grind. While I’m hoping that Blizzard will feel motivated by the positive feedback to create more, I’m also aware of the classic formula of tiered instanced content (dungeons, heroics, mythic and raids). While I’m incredibly excited by the announcement of Karazhan returning in Patch 7.1, I’m hoping that Blizzcon will also reveal further story campaigns just waiting to be unleashed. For now, though, Legion is an incredibly strong return to form. After writing off Warcraft due to Warlords of Draenor, Blizzard’s latest expansion has pulled me right back in with a grin on my face. Here’s hoping that smile lasts for a few more months yet. The Next Diablo: a Hybrid and Mobile MMO? This entry was posted on Friday, September 23rd, 2016 at 5:33 pm	and is filed under MMO Musings, Uncategorized, Warcraft. You can follow any responses to this entry through the RSS 2.0 feed. Both comments and pings are currently closed.